and anyone in a body. 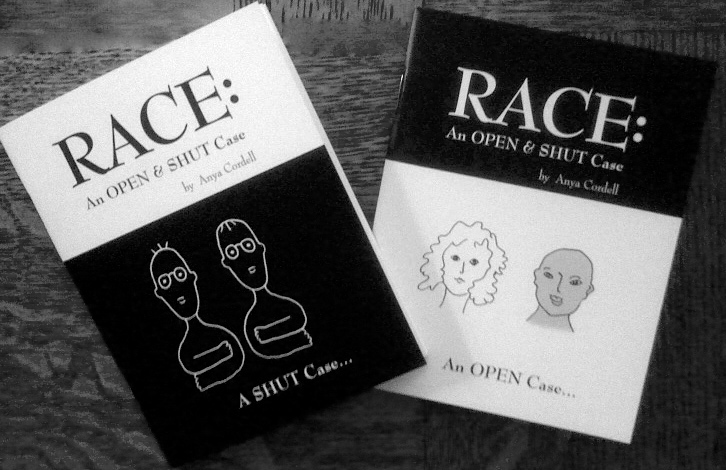 RACE: An OPEN & SHUT Case is a unique double-sided fable for children & adults. The stories of the Open and Shut families will turn your presumptions about 'race' and all appearance-based values upside-down, literally!. "Books to change your life"
Flips traditional preconceptions about race and appearance-based judgments, upside-down! in an utterly fresh & surprising way." The book to reach for before children bump into stereotyping or teasing, and for adults to re-evaluate the labels and judgments that often divide us. Transforms children who tease and those who are teased, and delights adults. in such an engaging way.